Latest Windows-based mobile phone will likely be supported over a single core processor. 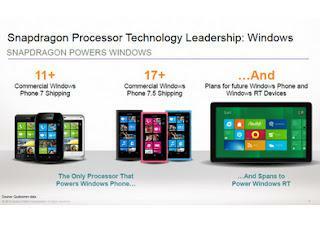 Android smartphone is the first quad-core processor while Windows Phone 7 seems to still be stuck with the single-core. In general, devices with dual-core processors can run better than single-core, such as Microsoft's laptop with Intel products. So the possibility of launching Windows Phone OS 8 will be supporting more than one. Rob Chandhok, SVP and president of Qualcomm Internet services confirm that the processor dual-core Snapdragon S4 is certified for Windows Phone 8. Even with dual core, does not mean the bottom line will is used. It may be only one of its core are used, while the other is turned off. But if you look at the Android smartphone market share has begun using a quad-core, it seems Microsoft did not want to lag far away from rivals. Most likely, Windows Phone 8 will use more than one processor core. We'll wait while Windows Phone Summit event June 20th next.